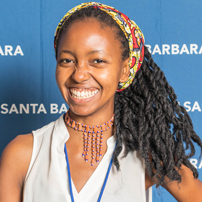 Charlene Macharia is the ALL Ladies League Santa Barbara Chapter. She currently works at University of California Santa Barbara as the Academic Initiatives Program Coordinator in the department of Student Affairs while pursuing her doctorate degree in Education. She is passionate about empowering people, especially women and youth of color, to embrace their God-given identity and to utilize their creative gifts and talents to channel healing and to build cross-cultural solidarity. Charlene enjoys traveling, swimming, watching movies, hiking, singing, blogging and hanging out with family and friends.